Alexandra Mukhina was born in the town of Salsk in Southern Russia. She began her cello studies at the age of 7 at a local music school, continuing her higher cello studies at the Specialised Music School attached to the Sergei Rachmaninoff Rostov State Conservatory. Following her education in Rostov, she joined the Rimsky-Korsakov St. Petersburg State Conservatory and studied the cello with Alexei Vasileev and chamber music with Sergei Urivayev. During her five years at the conservatory, Alexandra performed in a wide variety of solo, chamber music and orchestral concerts all over Russia. 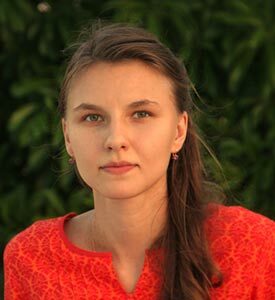 From the age of 17, Alexandra has taught children to play the cello and various theoretical disciplines – starting out as a student of pedagogy at the music school in Rostov, working as a private music teacher in St. Petersburg, and working as a teacher at a music school in her hometown of Salsk.